Started the day with an easy cruise across eastern Indiana to Vandalia, Ohio, from which I turned south to my father's house in Mason for a quiet Labor Day. Left Dad's place at 10:00. Just before I drove off, he commented that my right-front tire looked bad -- less than nine hours later, I would realize just how bad. But first I had to drive across Ohio, up and down West Virginia, and into Pennsylvania. West of Columbus, US 40 passes through a series of undistinguished small towns. As Broad Street, it runs right through the middle of downtown Columbus, past City Hall and the state capitol. Once past I-270 on the east side of town, though, it becomes a very nice little road indeed, alternately two and four lanes as it passes through an area which remains very aware of its National Road heritage. An all-but-obliterated marker from 1914 marks the reconstruction of the National Road; numerous mileposts, well maintained by local propertyowners, tick off the distance from Cumberland, Maryland; and local businesses link themselves to the National Trail. 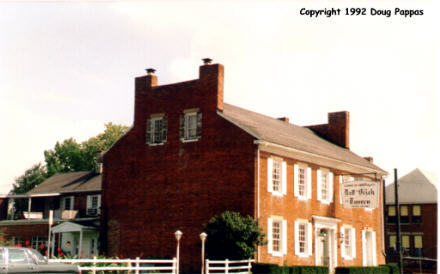 In Zanesville, US 40 passes over one fork of a Y-bridge dating to 1902, while ten miles east of town, in Norwich, the National Road-Zane Grey Museum honors the oldest of America's federally-funded highways. Though 40 remains picturesque all the way across Ohio, the advantages of the Interstate are rarely more apparent than on US 40's short trek across West Virginia. Whereas the Interstate sweeps boldly across the countryside, obliterating everything in its path, US 40 winds up, down, back, forth, sideways along a series of hills, taking at least twice as long to cover any particular distance. The only thing to catch my attention in West Virginia -- an ominous flatness of the right front tire, which I thought I fixed by adding lots of air in Wheeling. I didn't. A dozen miles west of Uniontown, PA, where I planned to spend the night, the tire went flat. I replaced it with the limited-purpose spare, then limped into town without finding any garage which looked able to help at 7:00 PM. 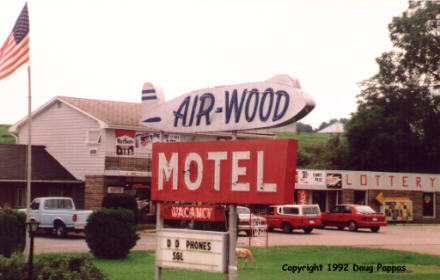 Even worse, though, none of the eight chains for which I carried motel directories had any properties near Uniontown -- with the local mom 'n' pop places looking much worse than average, I gritted my teeth and checked into the Holiday Inn. Never again! Even with a 10% AAA discount, I paid twice as much as usual, for a room older and worse-ventilated than usual The room TV was so old it didn't even get the cable channels above 13, which included both ESPN and CNN; the sink had flaking paint; the air-conditioner didn't properly ventilate the room even though it wasn't hot out; and my door stuck. Even the vending machine didn't work! Ugh. On the positive side, when I drove downtown at 12:30 to get something to drink (given the problems with the vending machine) a helpful attendant at an all-night Sunoco station found the leak, pounded out the dented rim, sealed it...and didn't charge me a dime! I'll be on the road again in the morning.